Fish Egg (Molecule Manicure) and Caviar Nails comparison! 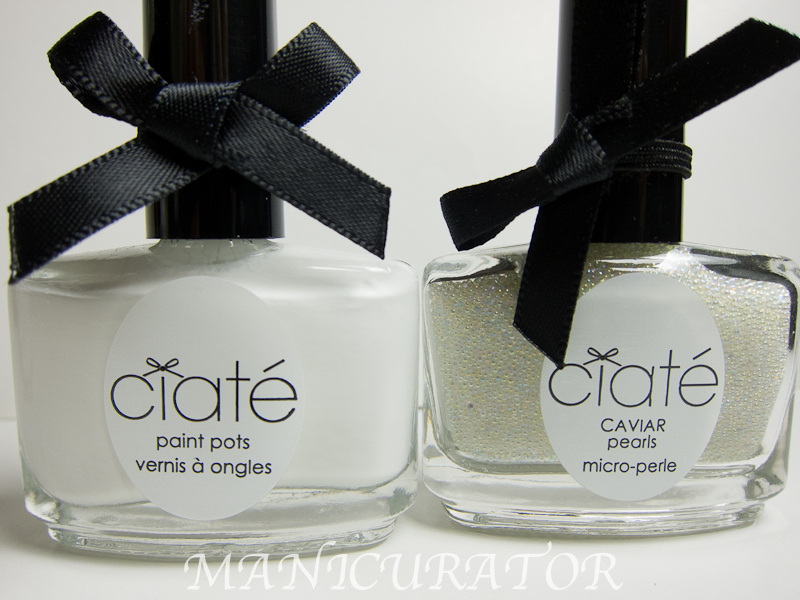 I'm genuinely bummed about the Ciate controversy regarding their request that bloggers stop using the term Caviar Nails or Caviar Manicure when referring to a microbeaded manicure. I prefer to stay out of any drama, so I will just present some findings... I've been so curious...that I HAD to go ahead and do this swatch, review and comparison. Hope it helps!! 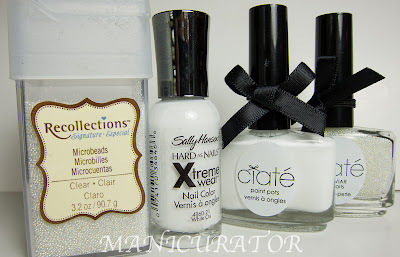 On the index and ring fingers I used Sally Hansen White On and Michael's "Recollections" Clear Micro beads. AKA the cheap version. This costs less than $10. On the middle and pinky fingers I used Ciate Caviar Manicure from Sephora AKA the not cheap version. You need to shell out $25 for this kit. 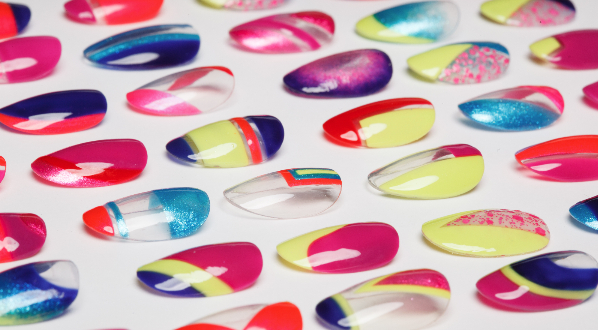 Which includes the polish, microbeads plastic tray and funnel. You absolutely need the funnel to get the overflow of beads back into the container. They should actually call the Ciate beads nanobeads. They are smaller than the Michael's beads. If packaging and presentation are important to you, and you have money burning a hole in your Coach wallet, then the Ciate is a must - available at Sephora in three different color kits! The Sally Hansen White On (on Index and Ring fingers) went on thicker and slightly more opaque. 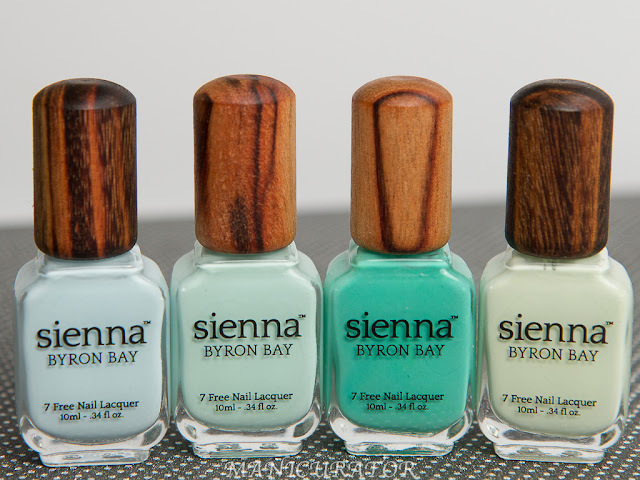 You could probably get away with one thick coat of this. Ciate Snow Virgin (Middle and pinky fingers) will never be a one coater. Thinner and streakier with the first coat, in fact, it probably needs three coats to be perfect. Can you see the difference? Index and ring are cheapo version. Middle and pinky the $$$ version.The sally Hansen polish is thicker and therefore covers up some of the beaded goodness more than the Ciate polish. In my opinion, it also means the Michael's beads will stay on longer. Will you shell out the money? Do you even like this beaded look? great comparison! I, too, like the Ciate microbeads better, but only when you do a side by side comparison. I would rock the cheap version too! You're awesome. Great review. I have not tried either yet so I would go for cheap to test it out. Can you follow up with something to let us know how they hold up? Dying to know if the slight difference in size makes a difference. Looks really pretty. yes!!! i agree with sue! i'm dying to know how the Ciate version holds up against the Cheapy version...thanks! The smaller beads do look nicer, cleaner. I'd shell out for it. To be honset, though, the trend doesn't send me, but I like it much better in white and crystal than black. It reminds me a little of a super modern wedding manicure. Thank you everyone! Much appreciate you taking the time to comment!! Super glad you found this helpful, I know I did. Great comparison and great job! The Ciate definitely does have a neater, more uniform look. I haven't decided how I feel about this. Sometimes I do like it but I will have to try it on myself to see how I really feel! 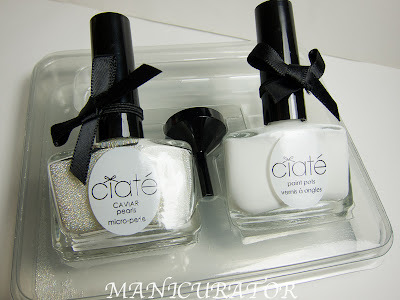 However, I won't be trying the Ciate version because I just can't afford that! This is really awesome. I liked the first caviar nails you did. My only fear would be that they would fall off in what I am cooking or distract the kids I tutor. Very lovely again Victoria. I like the Ciaté beads better just because they are smaller. However, price wins every time for me. :) Other than size they virtually look the same. I want to try this but I'm really bad about picking stuff off. Really informative comparison. Last weekend I had hunted down the Martha Stewart Micro Beads intending to do a caviar mani - so this was perfect! Was wondering how the mani "wore" for you. Did the beads come off easily over the next 2 days (that is, if you didn't purposely jump to another color!) Great site. Looking forward to future posts! I feel the same way as Sharra! I really dislike the caviar manicure. I just think it's weird!!!! The texture scares me. But clear on white is a perfect combination! They turned out absolutely gorgeous with the reflections of light! And I actually think the Michael's beads one look better too!!! But I guess I won't be rocking this soon. Perhaps on an accent nail, but not all of my nails together.